Compact size and lightweight, 130*130mm large working area. The stirrer shell is made of 316 stainless steel plate, stronger corrosion resistance. Adjustable Speed: 0~3000r/min; Max. Stirring Capacity: 3000ml. 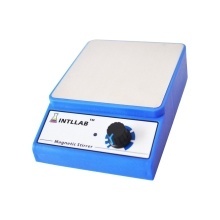 Widely used in scientific research, industry, agriculture, health and medicine fields. The beaker showed in the picture is not included.